“What’s the dog’s name?”, I was asked. For the first time I realized he didn’t have a name. Someone has to care enough about you as an individual to give you a name. But Dog #2 was never appreciated in that way. He was a thing. He had a purpose. But he was interchangeable with any other thing that could have served that same purpose. I was told his owner loved him. But in fact, the “owner” only really loved that he was useful in achieving his purpose – guarding his owner’s property. I only knew Dog #2 for one day. He mysteriously showed up one day then, without fanfare, disappeared the next. I have never been a dog person, but in that one day, Dog #2 changed that. My path crossed with Dog #2’s several days ago. I was leaving my house in the morning. He was sitting about 50 feet away patiently watching me. Since there are a lot of aggressive feral dogs in the area I was cautious and, to be honest, a bit tepid. We made eye contact and he just stared at me, unflinching. I thought that was odd behavior, since in one of the few episodes I watched of “The Dog Whisperer” Cesar informed me that making eye contact with a dog is aggressive behavior. But Dog #2 was not being aggressive. He just sat and watched me, perhaps looking for physical signs of intent from me as I was in him. After we looked at each other a while, I noticed he had a rope tied around his neck. That at least gave me a clue to his previous life. Clearly, someone had “owned” him. But that someone had also underestimated Dog #2’s will to be free. The rope had been torn at it’s end in what was probably Dog #2’s intense struggle to escape. I was reminded at that moment of a feeling I had in grade school, when I saw a drawing of an escaped African slave, whose hands were still tied, but was nonetheless free from his tormentors. His face was calm, belying the struggle he must have endured to regain his freedom. But it was the look of serene comfort and appreciation in freedom that I saw both in the eye of the escaped slave and in Dog #2. My first encounter with Dog #2 ended with my leaving without really understanding much about him. He sat just at the edge of my property line, so he clearly knew where my boundaries were and did not want to infringe on them. Dog #2 was a real mystery to me. I didn’t know where he came from, what was his life story or why he had come to watch me. But I did know that I liked him and wished I knew more about him. When I came home that evening, Dog #2 was still there waiting for me – still at the edge of the property. My dog Olive was standing about 20 feet away, sizing him up. The fact she was not barking at him as she does at any potential intruder (yes, even jet planes flying over our property), comforted me that Dog #2 did not mean us any harm. He sat quietly while both Olive and I circled around him, making sure he was not a threat, but a potential friend. Dog #2 struck me as a patient and perhaps even wise dog. He submitted to our inspection without complaining. Physically, he was a strong relatively large, muscular dog, but there was a gentleness about him that was disarming. So Olive made the first move. She approached him and they did the standard dog sniffing greetings. Suddenly, the two of them acted like old friends. I don’t know if dogs smile or if it’s just an illusion, but Dog #2 appeared to be grinning from ear to ear. The two of them started rolling around and playing with each other as if they had known each other since they were pups. It was truly heartwarming to watch such a spontaneous expression of pure joy. The only thing left for me to do was to cut off the ropes. I got a knife and approached Dog #2. He didn’t flinch but sat without moving while I cut off the only evidence I had of his past life…which by the way was far tighter than it needed to be, but apparently not as strong as it had to be. While Olive and Dog #2 frolicked in front of the house, I couldn’t help but be captivated by the spectacle. Here were two dogs that didn’t know a thing about each other, but they both knew how to share the joy of freedom, and it was beautiful to watch. That night, I went to bed with my own ear to ear smile. We had a new member to our family. Unfortunately, I didn’t sleep well that night. Olive and Dog #2 were busy protecting the land together. 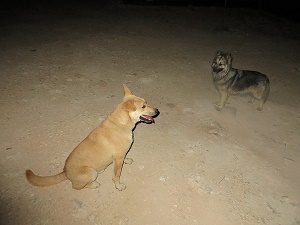 As I said, the area was full of aggressive feral dogs, and for some reason these dogs chose that night to approach my land. Olive and Dog #2 ran frantically around the land, claiming and protecting every inch. I saw them scurrying together from one corner of my property to the other. Barking in unison at any dog that got too close, then after driving him off, they would scurry off together to face off with the next threat. There was a hop in both their steps. They really loved their “job” and they seemed to love it even more doing it together as a team. The next day arrived with bad news. Dog #2 had an owner and the owner wanted him back. I was devastated. It had only been a few hours, but Dog #2 was a member of our family. More important than how I felt, I was heartbroken how Dog #2 would take this. He had chosen us from far away. He had chosen to adopt us as the family he never had. And now I was going to have to return him to the life he had thought he had escaped. I had comfortably settled into the expectation of sharing my home with a second dog and now the hope lay shattered in front of me. The owner’s brother had come to take Dog #2 from me and there was nothing I could do but watch. My stomach turned as I watched how oblivious Dog #2 was. He trusted me….completely. He shouldn’t have. The brother put a leash on him and walked away, with Dog #2 walking obediently by his side, not imagining I had betrayed him. I went by the brother's house that afternoon, and he still had Dog #2. He was chained to a fence waiting for the owner to come get him. Dog #2’s was staring emotionless at the ground. He was lethargic...maybe even depressed. I asked the brother if I could keep him on my property since he was just going to chain him until his brother came, and he said sure. I walked him to my property. He didn't seem happy or unhappy. he just walked along. When we reached my property, I thought he would be ecstatic to be back "home", but his demeanor didn't change. I unleashed him, turned around and went to the house. A few minutes later I went back outside, but he was gone. I never saw him again.